On your DIET, I mean! Cheat day. You’ve probably overheard the ripped fitness dude at the gym talking about – or rather longing for – his cheat day. He’s practically drooling as he tells his buddies about the giant stack of pancakes, the extra-large pizza, and the half gallon of Ben & Jerry’s Rocky Road he’s planning to eat. Maybe. Maybe not. A recent study showed that obese men who restricted food for two weeks and then had a single cheat day lost more weight and kept it off longer than those who only restricted food. This is very intriguing, and there's certainly plenty of anecdotal evidence from the realm of body building that cheat days can be favorable for muscle growth and fat loss. How good you are at timing your cheat days correctly...there's a science. It gives you a psychological break. Ever notice that when you restrict food and diet down hard, all you think about is food? Having something to look forward to can help you get through the tough days. It gives your body a physiological break. Hard training combined with food restriction for the purpose of shedding fat can drastically lower your metabolism as your body fights to keep itself alive - remember, our bodies are biologically programmed to keep us alive in times of FAMINE! For athletes who are training very hard and restricting food at the same time, occasionally overeating can actually boost your metabolism and help you burn more fat. Key word: occasionally. It can help you break through a plateau. If you understand “nutrient timing”, you can use cheat meals to your advantage for both muscle gain and fat loss. Cheating can help you remember why you eat healthy. Most people don't know how good they can feel until they consistently eat healthy. Having a heavy meal or a cheat day every now and then will immediately help you realize how much of an impact food has on your body and the way you feel. You MUST be living a strict 90/10 or 95/5 lifestyle. Your nutrition must be on point EVERY OTHER DAY OF THE WEEK. No excuses. You gotta work out. HARD. The vast majority of people don’t work out hard enough, eat too much junk in general, and don’t understand the importance of timing a cheat day to get the maximum advantage. The average person simply does not have a need for a weekly or even a monthly cheat day. It can get out of hand. One cheat meal turns into a cheat day, then a cheat weekend, then a cheat week, then a cheat month…and so on…until you wake up one day and realize you’re eating the Standard American Diet. You will feel terrible. Like worse than you've ever felt in your life, both physically and mentally. This is good because it reminds you that you don't want to feel that way on a regular basis...but bad because, well, you feel awful! It's not healthy for your body. Eating a super clean diet and then swinging to the complete opposite end of the spectrum once a week or even twice a month shocks the body and can still cause health problems down the road. You will still be putting yourself at risk for high blood pressure, high cholesterol, and diabetes. It can cause an eating disorder to develop where there was none before. You plan to enjoy a single slice of your favorite pizza on your cheat day…and wind up losing control and eating the whole thing. Unfortunately this type of behavior quickly turns into a habit, which can then lead to the establishment of an unhealthy pattern of eating and restricting. You probably don’t need one. Unless your eating habits are close to perfection six out of 7 days per week AND you’re training hard, you don’t need a cheat day. For the majority of Americans, pretty much every day is cheat day anyhow. If you are training regularly and have a squeaky clean diet, try adding a cheat day twice a month to see how your body responds. If you do this for a couple of months and your pants still fit the same or even begin to feel looser, you know a cheat day or cheat meal might be helping to boost your metabolism. On the other hand, if you notice your measurements start to creep in the wrong direction, you may need to back off and cheat less often. Stay off the scale. I wish women would just get rid of their scales. Period. Weight is a horrible measure of fitness and progress...but I digress. It's doubly important to stay off the scale for a few days after you cheat. Eating a load of sugar, salt, or carb-rich foods (most cheat foods are rich in all three) will cause your cells to retain extra water. Your weight could increase by up to 10 pounds...but rest assured that you gain little, if any of that weight, as fat. Cheat day is not a license to binge...but often turns into one. If you go totally off the deep end and eat massive quantities of junk food for a full day, you absolutely will ruin whatever progress you made over the past week or two weeks. You'll also set yourself up for a rough start to the following week. This is, unfortunately, especially true for women. We have slower metabolisms to begin with (because we’re smaller than men) and we tend to put on fat much easier (because of our hormones). I know I’ve been calling it a cheat day (because everyone else does), but retrain your brain by calling it a TREAT day. The word “cheat” implies that you are doing something wrong. But if you've been working really hard in the gym and your diet has been perfect for weeks on end, there should be no guilt in allowing yourself a treat day! 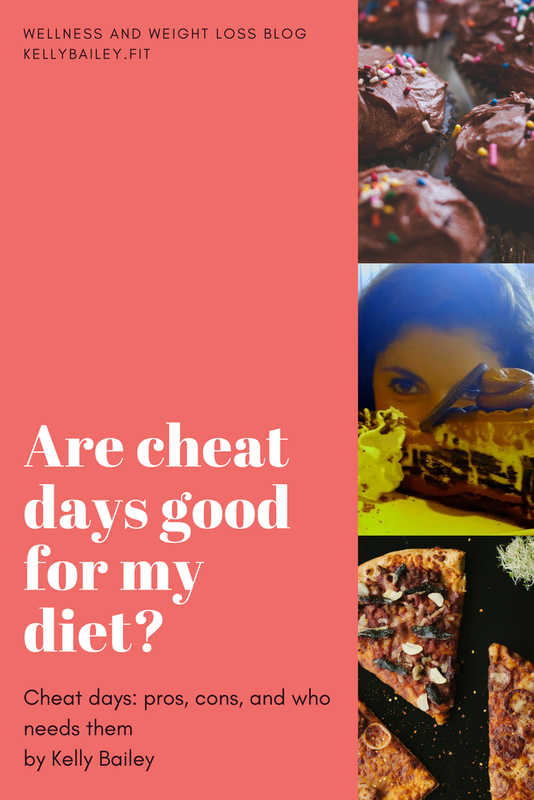 Advanced weight lifters, fitness competitors, athletes, and folks living a strict 90/10 lifestyle may benefit by including a cheat - oops, I mean treat - day once or twice a month for both the psychological and physiological benefits. These folks follow strict meal plans for weeks or months on end and consistently work out hard. For the rest of us, there's really no reason to be as restrictive with our day to day diets as a fitness model, body builder, or pro athlete. And though it may be nice to think about spending a full day stuffing our faces with pizza or donuts, the simple reality is that a cheat day isn't necessary and will probably hinder our progress toward becoming balanced, healthy, strong, and happy human beings. Being healthy and loving your life are not mutually exclusive concepts! There's nothing wrong with eating foods you love and even including them in your diet frequently. I encourage my clients to focus on eating healthy 80% of the time and taking a more moderate approach that allows smaller but more frequent treats and indulgences for the other 20%. This is a far more enjoyable and healthy way to live than white-knuckling through a month of hunger for a single stuff-your-face-all-day cheat day! You CAN reach your health goals AND love your life. Unless you plan to model for a fitness magazine or try out for an Olympic sport, there's no reason why you can't enjoy foods you love - even every day! You simply must do so in a mindful and moderate way that allows you to reach your fitness goals while still enjoying your life. So raise that 5 oz. glass of wine and propose a toast to the healthy salmon salad you're about to eat! Are you at a loss for understanding how to balance your health and happiness? You're not alone. I struggled for years. I starved, binged, took pills, went on every diet, ran a half-marathon, did insane workouts - and none of it worked. Sometimes I got lean. But I wasn't happy...or healthy. I still struggle sometimes to be happy with my body, but most of the time now I feel balanced. I live a lifestyle that allows me to be healthy and maintain a stable weight that's right for my body...yet still be happy with my life. For me that means honoring my body by exercising less and eating more delicious, wholesome, and healthy food. It means having a glass of wine with dinner. It means having a dish of ice cream or a cupcake...and being okay with it! It means loving myself enough to throw away my bathroom scale and stop comparing myself to the woman on the cover of a fitness magazine. It means understanding that I don't have to have the perfect body to be a healthy, strong, and fit mommy to the most beautiful little girl in the world. Balance means leading by example and showing her that eating healthy foods and moving her body should be a form of self-love...not deprivation or punishment...and that it's also okay to cut loose and have a slice of cake every now and then! What does living a balanced and healthy life mean to you? If you're ready for a different approach to health and weight loss, sign up for my next Six Month course HERE!